A jewel in the heart of the medieval historical centre of Rome. Our apartment is located in Via dei Banchi Vecchi, one of the most characteristic and interesting streets, where history, art and craftsmanship intertwine with food and wine excellence. Here, in the aristocratic and bourgeois buildings built between the sixteenth and seventeenth centuries, where the stories of ancient events still echo, between legends and reality, today we find artisan shops, antique shops and precious niche products, but also art galleries and workshops and, in order not to miss anything, refined wine bars and restaurants guaranteed by Michelin stars. Not to mention the convenience of supermarkets and excellent bakeries, within a few hundred meters. All this just a few minutes walking from Campo de’ Fiori, Piazza Navona, Castel Sant'Angelo, the Vatican and Piazza San Pietro, Trastevere. You can reach everything just walking. If you prefer, bus stops and taxi parking are in Piazza Chiesa Nuova, very close. 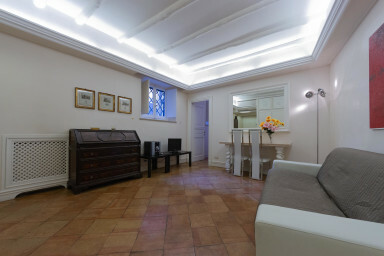 Our Navona Banchi Vecchi Apartment is therefore set in such a lively and pleasant environment, while assuring the future guests the utmost tranquility: a long corridor leads from the door of the building to the entrance of the apartment, which is then set back from the street. Nothing will disturb your sleeping and your privacy. The house is on the ground floor and consists of a living room with kitchenette, bedroom and bathroom. White predominates, it is the simple yet sophisticated canvas on which the classic furniture expresses its elegance, while modern accents - touches of “sealing wax” red and the transparency of Kartell plexiglass - recount contemporaneity and freshness. In the living room, a precious marble table with two seats, a three seater sofa that, if necessary, can become a one and a half (or French) bed, a bookcase, a useful chest of drawers, a television and a stereo system. You open the doors of a white, neoclassical piece of furniture and the kitchenette appears: small, compact, complete: from essential appliances to everything you need to cook. In the bedroom, a comfortable double bed and a large wardrobe with sliding doors. The bathroom is modern and comfortable, with a large shower that will give you moments of absolute relax. In each room, windows, placed in the upper part, overlook inner courtyards. Living here, even just a few days, means making the fascinating experience of being an inhabitant of medieval Rome, including coffee at the bar in the square, newspaper at the kiosk (provided with foreign newspapers), baked pizza, a walk on the “sampietrini” (bevelled stones of black basalt) in via Giulia up to the Arco Farnese, peering through the inner courtyards of some of the most beautiful buildings in the Eternal City and maybe walking up to the Tiber embankment, watching the unstoppable flow of the river. Having lunch in delightful and not too touristy restaurants (which we will be glad to suggest you), buying flowers (and fruits and vegetables and cheeses and spices) in front of the statue of Giordano Bruno and then returning there, in Campo de' Fiori, for the aperitif. The best ice cream is in Via del Governo Vecchio. From there, cone in hand, you go to Piazza Navona, a marvelous symbol of Baroque Rome. For your after-dinner stroll, cross Ponte Sisto (Sisto Bridge) and, arrived in Piazza Trilussa, get lost in the narrow streets: live music, street artists, every kind of bar open until late at night. Here there is the nightlife, every evening, all year long. Returning home will be safe, even if the party would last long. The area is extremely safe, at any hour. Comunicazione molto difficile con Francesca, la ragazza che ci ha accolto per il check-in: abbiamo ricevuto poche risposte a messaggi e chiamate sia i giorni precedenti il nostro arrivo sia i successivi. La mattina del nostro arrivo aveva addirittura il telefono spento. Durante il soggiorno abbiamo avuto un problema con i termosifoni e nessuno si è curato più di tanto di risolverlo: il tecnico è arrivato alle 8 di sera del giorno dopo pertanto abbiamo dovuto trascorrere la prima notte al freddo. La casa per di più è al piano terra e, nonostante il deumidificatore posto nella camera da letto, è davvero troppo umida e fredda. Dato il grande disagio creatoci, speravamo di ricevere delle scuse dal proprietario dell'appartamento che invece non ha mai pensato di contattarci. Unica nota positiva della casa è la posizione: centrale, ben collegata con gli autobus e comoda per raggiungere tutti i punti di maggiore interesse di Roma.